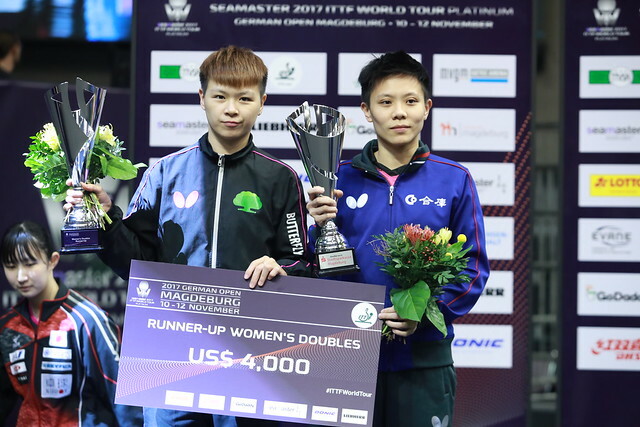 Thursday 9th November hosted the third and final day of the qualification tournament which precedes the Seamaster 2017 ITTF World Tour Platinum German Open in Magdeburg as unseeded players competing in the senior singles events contested preliminary round fixtures while over in the Under 21 competitions there was trophy success for China. The host nation enjoyed a plenty of success in the second preliminary round of the Men’s Singles competition as three German players progressed from the qualification tournament. One of the successful home competitors was Patrick Franziska, who defied the odds to defeat Korea Republic’s Jeoung Youngsik in straight games (11-7, 11-9, 11-8, 14-12) and will join fellow compatriots Ruwen Filus and Bastian Steger in the main draw. Jakub Dyjas was another player who was responsible for a shock result with the Polish representative condemning Brazilian star Hugo Calderano to an early exit. Despite losing out in the opening game of the tie, world no.61 Jakub Dyjas emerged victorious over world no.18 Hugo Calderano across five games (14-16, 11-6, 11-6, 11-6, 11-8) while Yuto Kizukuri bested Ukraine’s Kou Lei who is ranked 53 positions above the 18-year-old from Japan. There were mixed emotions for the Hong Kong contestants involved in the Women’s Singles preliminary round as Jiang Huajun and Lee Ho Ching experienced contrasting results. Jiang Huajun came out on top in a gruelling seven games encounter with Portugal’s Fu Yu (8-11, 12-10, 11-7, 11-8, 7-11, 10-12, 11-7) but Lee Ho Ching’s campaign has ended following her defeat to Liu Jia of Austria (11-5, 11-6, 4-11, 9-11, 11-9, 11-7). The upper half of the draw hosted a terrific battle between Suh Hyowon and Wen Jia as the Korean representative held off a strong challenge from her Chinese opponent (13-11, 11-8, 11-7, 7-11, 7-11, 5-11, 11-8) to book a meeting with the ninth seed Han Ying in the Round of 32. Disappointment for Wen Jia but there were scenes of jubilation for Liu Xi and Chen Ke, who claimed impressive victories over Miyu Kato (7-11, 7-11, 11-5, 11-8, 11-7, 16-14) and Chen Szu-Yu (11-4, 11-9, 9-11, 11-7, 9-11, 11-6) as nine competitors representing China advanced. The evening session of play saw the first title matches of the event in Magdeburg with the Under 21 trophies up for grabs. Chen Ke not only celebrates her qualification success in the senior competition but also her triumphant performance in the Under 21 Women’s Singles category after she accounted for Sun Mingyang in the final (7-11, 11-3, 11-7, 11-7). China also secured the Under 21 Men’s Singles trophy with Xue Fei prevailing over Japan’s Mizuki Oikawa (11-7, 11-8, 11-9) to reach the top step of the medals podium.